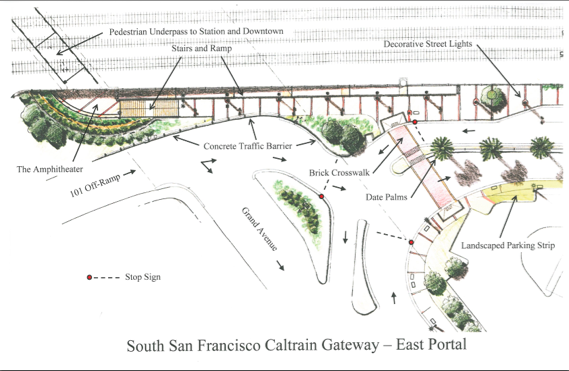 A centerpiece of the Â South San Francisco Station Area PlanÂ in progressÂ is a proposal to extend the Caltrain station further south, upgrade the bleak waiting area, and – importantly – to connect the station more directly to the downtown with an underpass. Â Currently Caltrain users need to climb several flights of stairs, emerge at a freeway offramp, and then walk at a sidewalk down the offramp to get downtown; or roll bikes, luggage or wheelchairs up a narrow sidewalk adjacent to another freeway ramp. South City is attempting to accelerate one of the major benefits of the station changes, by applying for a Safe Routes to Transit grant. The grant would pay for a feasibility study for the pedestrian/bike tunnel, in advance of the rest of the station upgrade. Â The feasibility study would updateÂ existing plans to accommodate future possible platform and passing track configurations.Â The ped/bike tunnel would improve the accessibility of the Caltrain station to and from downtown and workplaces. The Station Area Plan seeks to revitalize South City’s downtown and upgrade the industrial/office park area within a half-mile radius of the train station. 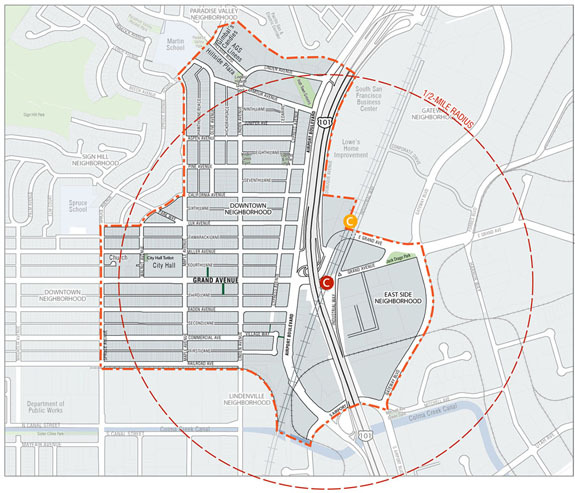 Better access to the train station is an important part of the Station Area Plan, a point often reinforced by City Council Member Karyl Matsumoto, who also serves on the boards of SamTrans and the San Mateo County Transportation Authority. According to Brian McMinn,Â Assistant Director of Public Works and City Engineer, the tunnel is expected to cost $10million to complete in a new estimate submitted with the grant, and the full station rebuild was forecast to cost $20 million when plans were drawn up in 2008. Â The City has already invested $1.8 million in right-of-way, property acquisition, and environmental remediation for the entry plaza and tunnel entrances andÂ has about $100k remaining in the Capital Improvement Program for the station improvements. 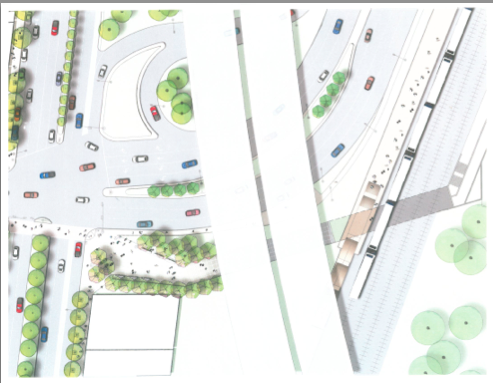 The Station Area Plan also includes designs for streetscape improvements at the entrance to South San Francisco downtown, including a public plaza. Â Currently the entrance experience is dominated by the 101 offramp. Â The traffic calming measures would create a safer and more pleasant walk to and from the train station. The full station upgrade would extend the platforms further south to more nicely connect with the tunnel. It would also add barriers disallowing crossing tracks when the train is in the station and therefore eliminate the “holdout rule” that prevents trains travelling in the opposite direction from stopping in the station at the same time for safety reasons. Â Caltrain has budgeted some funds in its 2014 budget for design, but would need additional money to rebuild the station. Is there a better diagram of how the holdout rule would be eliminated? Aren’t there UP tracks preventing building of a NB platform? Elimination of the holdout rule will have to be studied. I am not aware of any proposed solutions that have been developed. Any platform design will have to consider the UP tracks and right-of-way.